I was just telling Aaron how there were a few comments on his fanpage on facebook from people thinking they were going to see him at DragonCon (at guest panels, photos sessions, autograph signings) and that I had to make a post on there letting them know he was going as a ‘fan’ not a ‘guest’. Obviously all of us here already knew that. But for anyone that doesn’t read this LJ comm, they’re still under the impression that he will be there as a guest because the D*C website lists him as one. He doesn’t want to disappoint anyone that was hoping to meet him so he said that he might get a table for one day for a few hours just to sign for people who want something. I’m not sure how the announcement will be made regarding what day and time he will be signing. Maybe at one of the BSG guest panels or on one of those daily DragonCon update pages (not sure what the official name of that is) that you can pick up at the info booths. Or maybe it will just have to be pure luck of stumbling across him in the ‘hall of fame’. 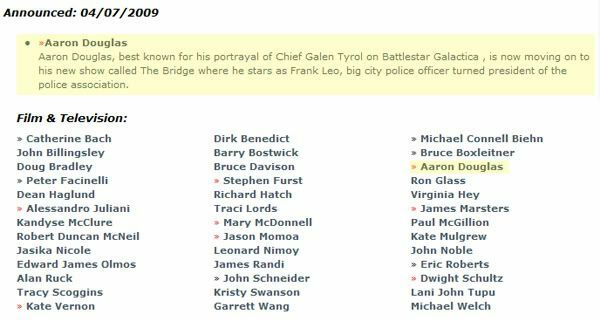 The DragonCon website have listed Aaron as a guest. Hmmmmm. I’m totally confused. He told me he was going as a ‘fan’ not a ‘guest’. I guess something changed in the last 2 weeks. Oh well, all that really matters is that he’s going to be there. Yay!!!! I will be there but not in a guest capacity. I will not be signing or doing panels. I hope to host a very specific party, we are working on details but other than that I will just be wandering around with the lads.